A fluorescent probe for H2O2 is described. 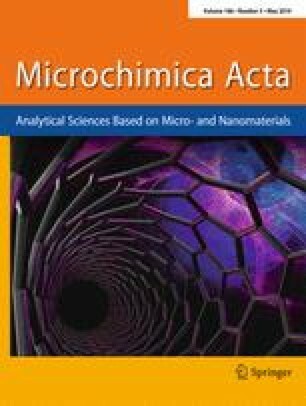 It is composed of MnO2 nanosheets and 5-carboxyfluorescein and was characterized by fluorescence, transmission electron microscopy, ultraviolet-visible absorption spectra, energy dispersive X-ray and Fourier transform infrared spectroscopy. The probe, with fluorescence excitation/emission maxima at 490/518 nm, responds to H2O2 in the 1 to 200 μM concentration range and has a 0.33 μM detection limit. The probe was used in enzymatic assays for glucose and cholesterol by using the respective oxidases which produce H2O2. Responses are linear in the concentration range from 0.5 to 200 μM in case of glucose, and from 1 to 300 μM in case of cholesterol. The method was applied to quantify glucose and cholesterol in (spiked) serum samples. 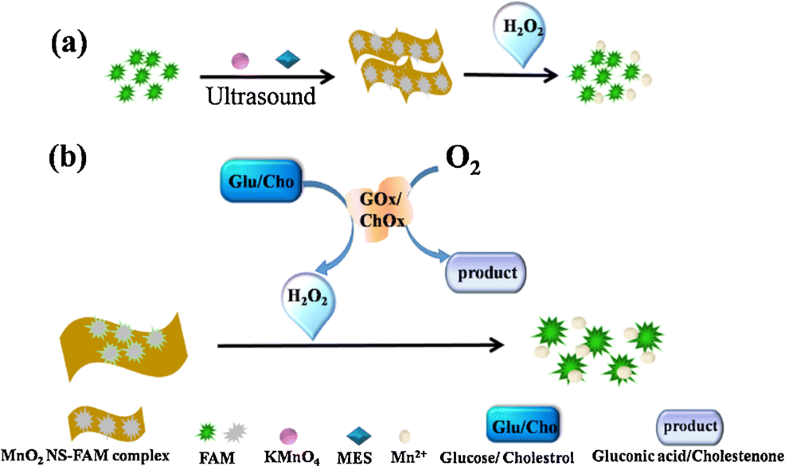 Schematic presentation of the principle based on hydrogen peroxide-induced degradation of MnO2 nanosheet-FAM complex for detection of H2O2 (a), glucose and cholesterol (b). Ting Han and Shengmei Zhu contributed equally to this work. The online version of this article ( https://doi.org/10.1007/s00604-019-3381-1) contains supplementary material, which is available to authorized users. This work was financially supported by the National Natural Science Foundation of China (Grants 21675001), the Anhui Provincial Natural Science Foundation (1608085 MB46, 1608085MC67), the Anhui Provincial Education Department Natural Sciences Key Fund (KJ2016SD23), the Key Program in the Youth Elite Support Plan in Universities of Anhui Province (gxyqZD2016023), Provincial Project of Natural Science Re-search for Colleges and Universities of Anhui Province of China (KJ2016A274).